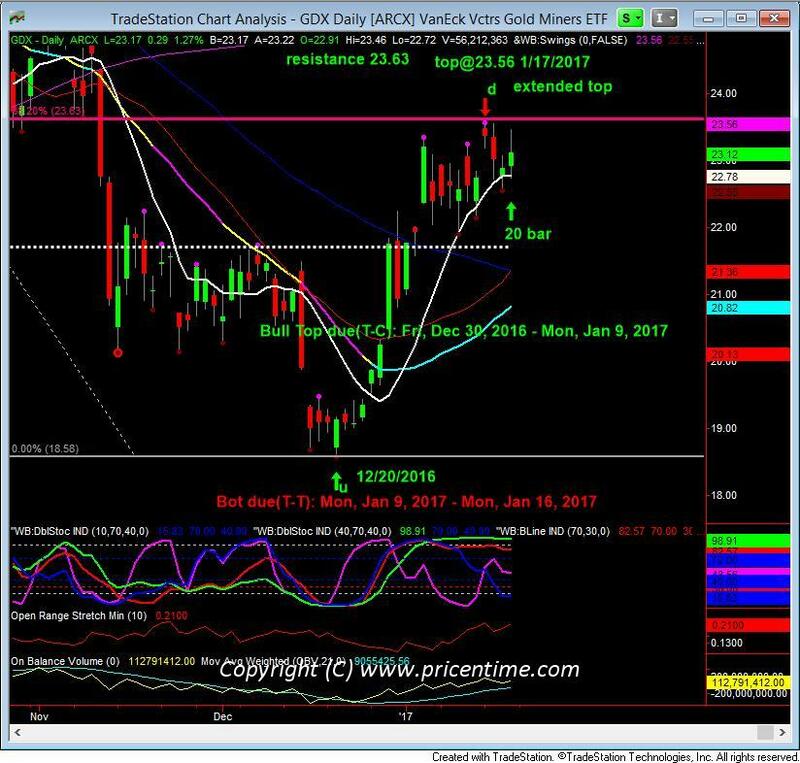 GDX spent nine trading days and it can’t get over 23.63 resistance. Yesterday (Wednesday Jan 18) we thought it could possibly overcome 23.63 to produce a cycle inversion, which would lead to the beginning of a new cycle. But it didn’t happen. We are selling GDX short at open. Stop loss 23.63. Stay tuned. Our short order was filled @22.72 at open on Jan. 19, 2017. It went down then rallied back up to 23.07 during the day. On Friday Jan 20th, it didn’t break down. It rallied to 23.47, but also failed to jump over the fence to be above 23.63. It’s been 20 bars for this cycle. By now it has spent 11 trading days trying to take over 23.63. 23.63 is the 38% retracement of the previous selloff of four months. 38% retracement is typically a serious threshold of a bear market rally. If indeed the gold bears are in control, they will have to keep it under 23.63. We are taking a chance with a stop loss of 0.91 to shoot for the price target at 18.58, which could give us about $4 gain. Time is running short on this trade, we should know very soon. This entry was posted	on Thursday, January 19th, 2017 at 9:29 am	and is filed under Precious Metals, Trade Recommendation. You can follow any responses to this entry through the RSS 2.0 feed. Both comments and pings are currently closed.